During the first forty post-war years, the centre of Athens flourished, became denser, changed both aesthetically and functionally, always acting as the hub of the economic and cultural life of the metropolis. A period of decline followed, with an increasing intensity over the last thirty years. The high density of the centre in conjunction with the increasing number of vehicles and the lack of an efficient public transport network, especially before the construction of the underground, as well as the increasing environmental degradation, motivated the centre’s population to leave and ousted many activities from it. Also, economic prosperity and the adoption of new lifestyles and consumption patterns led a part of the population of Athens to search for new locations in the city’s surroundings, where daily life would now better reflect the new social values​and standards. The inevitable, yet excessive and unplanned, expansion of the metropolitan complex, was accompanied by the creation of local retail markets and shopping centres, thus weakening the traditional commercial centre of Athens. The recently urbanised population of the city lacked collective memory, urban culture values​ and consciousness and was probably unwilling to maintain an active interaction with the city’s past. Of course, there never was a serious social demand for action by the state to reverse the deterioration of Athens’ centre. The building rights attributed to land ownership during the growth period of the city centre promoted intensive exploitation of land and resulted in high profits for the land development circuit. The shortage of housing for the rapidly increasing population and the lack of space for the flourishing economic activities was given some sort of solution, mainly by using the flats-for-land exchange system. In place of the old, low height buildings new ultra-modern multi-storey buildings gradually appeared, which utilised private space as much as possible, both vertically and horizontally. State-of-the-art apartment buildings and luxury offices and shops were erected, able to accommodate much more population and activities than in the past. This is how a building stock of crowded cells was created, often connected by charming arcades that lead to public spaces. Often elegant, but usually imposing, some of these buildings are now part of the city’s architectural heritage, even when they are not listed, as some older buildings are: they had every right to be listed, since they survived the flats-for-land period. 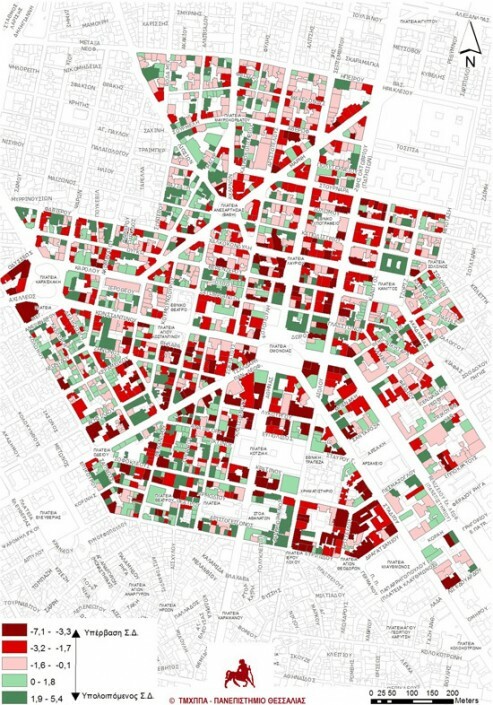 The conditions of the building stock in central Athens are now very problematic, at least for a significant proportion of the centre including 1650 buildings presented below, as recent studies by the Planning and Regional Development Engineering Department of the University of Thessaly show. The building stock in Athens city centre is largely devalued today. More than half of the buildings (55%), over a wide study area, were built fifty years ago, while about 20% of them are quite older than that. 15% of the buildings were built during the twenty-year period from 1970 to 1990, while very few buildings (representing approximately 7% of the total stock) were built from 1990 until today (Map 1). However, the age of the building stock would not be such a problem, if the buildings were well maintained and met the requirements of their current users and if some of them adhered to high architectural standards. Almost all buildings today require costly interventions to be restored, modernised and become energy efficient (Map 2). The cost of restoration and modernisation for over 60% of the buildings exceeds their current (2015) market value. 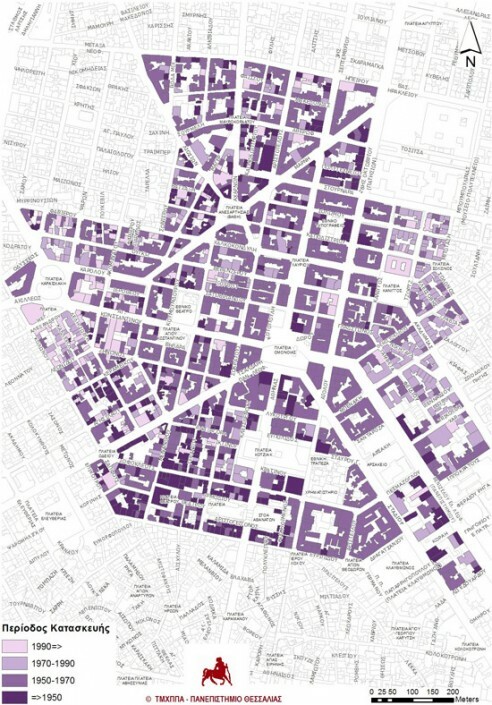 The map shows the buildings whose built surface exceeds or falls short of the limits allowed under current building coefficients, after their reduction over the last few decades. Red colour shows properties where existing development exceeds the currently applicable building coefficient. Green shows properties which can be developed further. Almost all of the plots have been built under a high building coefficient regime. The reduction of coefficients over the last three decades had rather limited results (Map 3, in conjunction with Map 1). Given that the built surface of many buildings exceeds the surface that could be built under current building coefficients, it would be very difficult or even utopian to implement proposals that foresee the demolition of buildings, to rebuild them or to generate free public spaces. This happens because property compensation requirements have not been sufficiently thought through, given the circumstances of the crisis, or the ineffectiveness of instruments like the Building Coefficient Transfer. High plot coverage ratios and high building densities make it rather difficult to apply the principles of bioclimatic design to the restoration and modernisation of old buildings. However, high density could be one of the city’s advantages, at least when it comes to energy saving, under certain conditions. Data source: Author’s research, Q3 2013. The map shows the cost of restoring the building stock, with an extra cost for energy upgrading and with no further internal or external interventions. Data on the maintenance condition of each building were collected through on-site inspections. The data were processed using an advanced algorithm. During the crisis, very high levels of empty properties were recorded, both in ground floor shops (Map 4) and multiple-use spaces on the building floors (Map 5). In some areas of the city centre, unoccupied premises reach up to 40% of the total built surface of ground floor shops and approximately 37% of the space on upper floors. 18% of the buildings are entirely empty, including many listed buildings. These particularly high rates of empty premises are a typical example of the crisis in the city. Apart from the degradation of the city’s image, its social and economic functions have also been thoroughly affected. 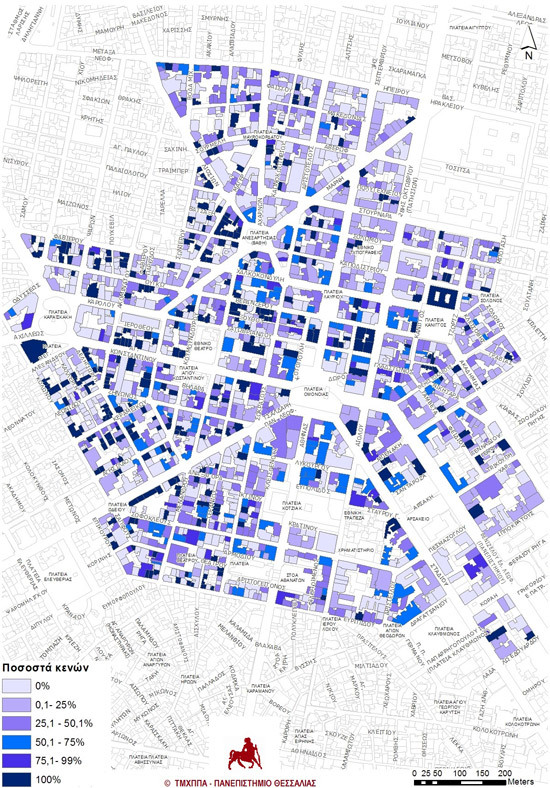 The map shows empty ground floor commercial spaces in each building, as a percentage of the total ground floor area. 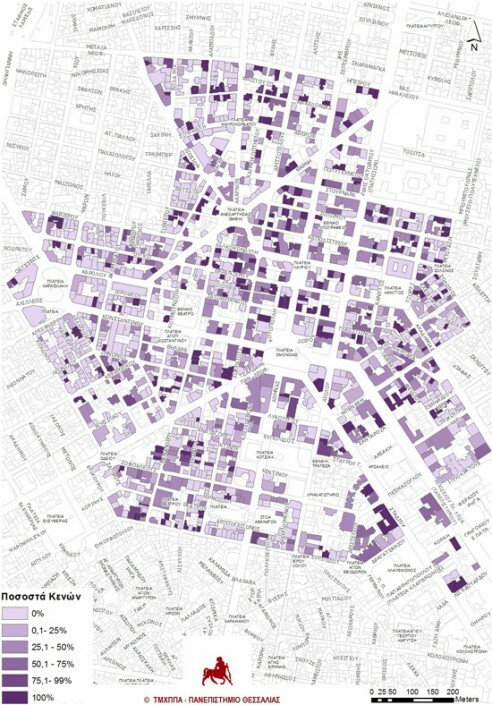 The map shows empty spaces in each building, as a percentage of the total building surface, excluding ground floor and basement spaces. Two of the main structural features of property ownership of existing buildings in the city centre are micro-ownership and multi-ownership. These features are primarily due to micro-ownership of land, since more than 80% of the plots cover less than 500m2. On these small plots, people erected buildings with high rates of co-ownership. In a total of 1650 buildings studied, the average number of co-owners is 32 people per building, as results from the processing of primary data from the Land Registry SA. Approximately 50% of the buildings belong to more than 75 owners each. Several buildings, of a rather big square footage, were found to have more than 300 co-owners. Multi-ownership is more intense in office buildings and undoubtedly contributed to their depreciation, mainly due to difficulties in management and maintenance. High rates of co-ownership and micro-ownership suggest the limited presence of significant property owners in central Athens and demonstrate the wide diffusion of property ownership among all social strata. Consequently, the deterioration and devaluation of the building stock, combined with the economic crisis, has become a phenomenon with significant social implications. It has devalued the assets of many smallholders, for whom the investment of their savings in city centre real estate used to be a significant choice of their life cycle. 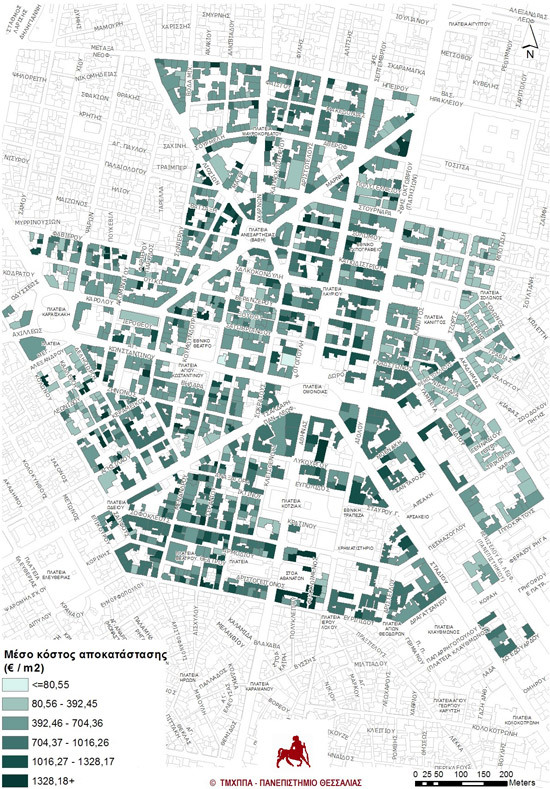 Buildings in the centre of Athens are in a poor state of maintenance, energy-intensive, with high rates of empty spaces and accommodate low added value uses for a metropolitan centre. These obsolete and devalued buildings can no longer host central functions that are normally clustered in the centre of a modern metropolis. Due to high restoration and modernisation costs, high degree of co-ownership and low rents, they are constantly devalued and gradually abandoned. Because of the increasing problem of building abandonment, a vicious circle has been created: the urban environment is degraded because of abandoned buildings and the buildings are abandoned because of the degradation of the urban environment. The phenomenon is gradually spreading throughout the city, with multiple economic and social consequences. The present intense and persistent economic crisis is not solely responsible for this situation; this should be rather attributed to the State’s shortcomings in spatial planning and management. Moreover, the current institutional framework makes any intervention in multi-ownership buildings almost impossible. Almost all vacant property owners, particularly fractional owners of abandoned and semi-abandoned buildings currently find themselves in a very unfavourable situation whereby they pay high taxes without any actual prospect of reuse or sale. Upgrading individual premises that are part of larger blocks would not add value to them nor to the whole building, in terms of market prices, aesthetically or functionally, because public spaces and their equipment are obsolete, especially under the prevailing conditions of high real estate supply and almost non-existent demand. The housing stock of the city centre, especially over the last decade, has been gradually excluded from the processes that support economic growth and socio-economic development. A vast source of wealth has been continuously depleted over the last decades, causing incalculable economic and social consequences, given the extremely high dispersion of property. For the financial system, the building stock of the centre is no longer of interest, not only because of its low market value, but mainly because of the high business risk involved in financing investments in it. Not being able to deploy real estate as collateral arrangements for loans, people lose the opportunity to utilise precious resources for funding production activities. Given the deterioration of the urban environment and the economic crisis, every effort to modernise the vast majority of buildings turns out to be unprofitable, and therefore impracticable, as shown by a significant number of feasibility studies on building restoration, carried out in the framework of research programs of the University of Thessaly. These facts also justify the total lack of real estate market mobility in the city centre, either regarding fractional properties, or prestige buildings. This unfavourable situation seems extremely difficult to reverse without the implementation of public policies and measures, in order to improve both public space and the building stock. Otherwise, even when the economic crisis is over, potential users of the city’s central locations will be forced to search for locations outside the centre to settle. Given the wide social dispersion of ownership, maybe the most important question arising is not the potential gentrification of some neighbourhoods, but the matter of social justice for people who have invested in the city centre and were forced to leave their homes and to shut down their businesses due to its degradation. Ευρωπαϊκή Οικονομική και Κοινωνική Επιτροπή (2010) Αναγκαιότητα εφαρμογής μιας ολοκληρωμένης προσέγγισης στην αστική ανάπλαση. Βρυξέλλες. Πανεπιστήμιο Θεσσαλίας Τμήμα Μηχανικών Χωροταξίας Πολεοδομίας και Περιφερειακής Ανάπτυξης (2014) Διερεύνηση και πρόταση θεσμοθέτησης μηχανισμών και κινήτρων για την αναβάθμιση του κτηριακού αποθέματος στην ευρύτερη περιοχή ανάπλασης της οδού Πανεπιστημίου. Αθήνα. Πανεπιστήμιο Θεσσαλίας Τμήμα Μηχανικών Χωροταξίας Πολεοδομίας και Περιφερειακής Ανάπτυξης (2014) Διερεύνηση ολοκληρωμένης αστικής παρέμβασης στο κέντρο της Αθήνας. Αθήνα. Available from: http://www.ypeka.gr/LinkClick.aspx?fileticket=cwreF0yvjYc=&tabid=37&language=el-GR.